There was a time when Disney was the first word in enchantment. They didn't call it "The Disney Magic" for no reason. Something effervesced in Pinocchio, blossomed in the cels of Bambi, and soared in Fantasia. You've got to believe that Papa Walt knew it when he saw it and managed to capture that lightning in a bottle more than once. The Chronicles of Narnia: The Lion, the Witch, and the Wardrobe developed as a film under the magnifying glass of Lewis aficionados everywhere. Scrutiny was most certainly given billing as one of the production team, although I could not find him listed in the credits over at IMDB. Having now seen the film, I want to say that this is a good adaptation that hews true to the book, and only adds to or subtracts from it when needed—something the producers do with skill. Most of us should be pleased with the final outcome. However, several reviewers have noted something missing from this film: enchantment. This is an astute assessment, I believe. I caught myself wondering when Tinkerbell would appear on the scene and tap her little wand against the background, revealing true magic in the production. That didn't happen, sadly, and the film stays good, but never ventures into magical. 1. Aslan's presence was formidable, and the special effects team gets an A+ for rendering him so perfectly, but the link he has to the children—so necessary for our belief in their loyalty and love for him—is not given enough screen time. One scene with him cavorting with the children would have established the mood needed to convince us all of the children's devotion. Otherwise, their allegiance seems manufactured, weakening the magic. This may not have been covered in depth in the book, either, but somehow Lewis's storytelling makes this believable.2. The merrymaking of Aslan's army at his arrival wasn't shown. If there was joy, we did not see it. A minute of partying would have been all that was needed. 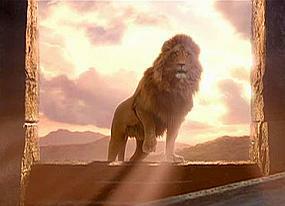 Instead, Aslan's there, some knees are bowed, and that's it. If it was a money issue, a minute taken from the battle scenes would have supplied the funds. 3. The film was lacking in sensory details. There's a way to show flowers visually that can make an audience catch a whiff of their aroma. The filmmakers captured the essence of the always-winter-never-spring Narnia perfectly, but when the world thawed, we should have been treated to an explosive springtime, filled with the smells and sounds of the season. This is Aslan's vernal triumph, is it not? Unfortunately, our senses went wanting. 4. Music. We forget how much an excellent soundtrack serves to enhance the mood. I believe that the single biggest letdown in this film is that the music lacked power. I can't remember the last time I saw a film where I was painfully aware that the music failed to enliven the action on screen, but repeatedly I was pulled out of Narnia because of a lack of appropriate soundtrack underpinnings. I think back to Excalibur, the Arthurian fable from the early 1980s. Yes, that film had an original look, but more than that, the soundtrack was flawless. 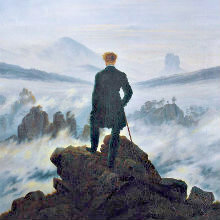 Repeated excerpts from Wagner and other classical greats filled the movie with soaring energy. When Arthur's bier is borne across the waters to heaven, "Tristan's Funeral March" plays to thrilling effect. And though we've heard it in a zillion other films since, Orff's "Carmina Burana" was never more brilliantly applied than in this film. 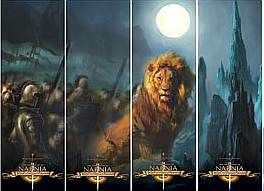 Beyond any other element, exuberant music is the missing pixie dust in this first Narnia film. When thundering brass is called for, we get weak strings; when music akin to Beethoven's "Ode to Joy" is essential, we are instead treated to a timid flute passage. Nearly every scene had the wrong musical backing. Mild, mild, mild—and it hurts the film tremendously. When a mythic fantasy adventure ends with Alanis Morissette singing, something's wrong. Some will consider this nitpicking, but in the case of the music, I think it's a glaring fault. Looking back, I can't think of a film I've seen where poor music detracted so obviously from what was otherwise an excellent film. So perhaps we have a first here. I've not seen any other reviews that mention this, but it is so striking to me that I'm at a loss to explain why other (better) film critics have said nothing to this point. I simply note this miscue and ask if others heard what I did. Disney, this is my call to you: When time comes for the DVD release, find a way to ratchet up the soundtrack with better music. I've got to believe that it can be done affordably; the DVD sales on this one will be huge, so the money will be there. DVD releases today fiddle with soundtracks as much as anything, so there's a precedent we're used to. Massed choirs, time-tested classical music excerpts—anything will help here. Do it for the audience. Aslan will thank you for it. We're going to see the Narnia film today. Last night, I picked up tickets and asked the usual question of the ticket seller: "Which of the four screens it's on is the biggest?" This is how I pick my showing times and a reason I like to buy tickets the day before. If I'm going to spend money on a movie, I want to see it on the biggest screen possible (or see it on a slightly smaller screen if it's digitally projected.) Her reply: "Our five biggest screen are devoted to King Kong." Somehow, I knew that would be the answer. But it seems that the Lion may be a bigger force than the Gorilla. News is coming out that ticket receipts for King Kong are running under expectations. Pundits are cutting the predicted gross take of Peter Jackson's latest by almost a third already. Ouch. This doesn't surprise me, though. King Kong was never much of a story. An oversized gorilla develops a weird interspecies affinity for a blonde, gets hauled out of his native land, then runs rampant through New York. Excuse me while I yawn. The big draw for the original release of King Kong was its groundbreaking special effects. People had never seen anything like that before. The draw for the mid-Seventies remake ran along the same lines. The problem with this latest update is that King Kong is still just an effects movie, but the kind of CGI effects we've become inured to. Yeah, he may fight three Tyrannosaurs in this one, but we've seen Jurassic Park I, II, and III already. We live in different times, too. The World Trade Centers featured in the first Kong remake are gone. Trying to rouse some feelings for a special effects gorilla are tough to come by when New Yorkers are still finding bits of rubble on their streets. So I'm not surprised Kong isn't doing well. When I first heard that Jackson was remaking it, my first though was, Why? That was not the same impression I got when the Narnia films were announced. There the thought was, Cool. Now just don't screw them up. From what I'm hearing, Narnia came out okay. Can't say the same for the big ape. Filmmakers who pronounce things like, "I loved ____________ and just had to remake it," usually get disappointed when the viewing public doesn't share that same burning desire for a remake. Peter Jackson should have known better.